A neighbor went to Nasruddin to ask him to borrow his donkey. “It is out on loan,” said the Mullah. At that moment a loud braying was heard from the stables. 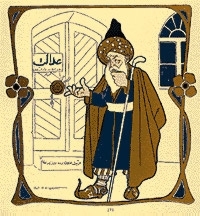 Mullah Nasruddin is plainly one of the greatest figures of Muslim folklore. Spiritual fool, wise clown, mirror of humanity or deep pool of knowledge – the Mullah features in jokes that transcend all barriers and reappear in different versions in places as diverse as Mongolian drinking tales and the Simpsons. “To keep the tigers away,” answered Nasrudding unperturbed. An everyman and a fool, but if you are patient and perceptive enough you can see the subtle layer of philosophy underneath the joke and the surreality. Sometimes he is awfully sly, though. “Add it now, brother, and we shall both partake,” said the Mullah. Mullah Nasruddin walked into a shop one day. The shopkeeper came forward to serve him. The stories are taken from Idries Shah’s collection.